Talk about irony! While the 2016 NFL (National Football League) Super Bowl aired to millions globally, I was sitting in a darkened theater watching Concussion, a film that questions the inherent nature and safety of America’s favorite pastime, football. A biographical docodrama, Concussion tells the true account of Bennet Ifeakandu Omalu (brilliantly played by Will Smith), a gifted and highly accomplished forensic neuropathologist who makes an earth-shattering medical discovery, uncovering a hard-hitting truth about American Football, one that links death-dealing brain trauma to the pigskin sport — a consequence of repeated blows to the head (otherwise known as concussions) during regular play. Having identified and exposed these long-run repercussions, Dr. Omalu is not instantly hailed an American hero; in fact, his conclusions (allegations the NFL want silenced) irritate those in the professional football ‘business’ and plant the doctor in some dangerous and seriously murky waters. Now, at odds with one of the most powerful and influential institutions in the United States, Dr. Omalu — a man driven by truth — tackles the NFL enterprise head-on, with his findings threatening the country’s cultural, social and economical interests and the very fabric of the worshiped sport. 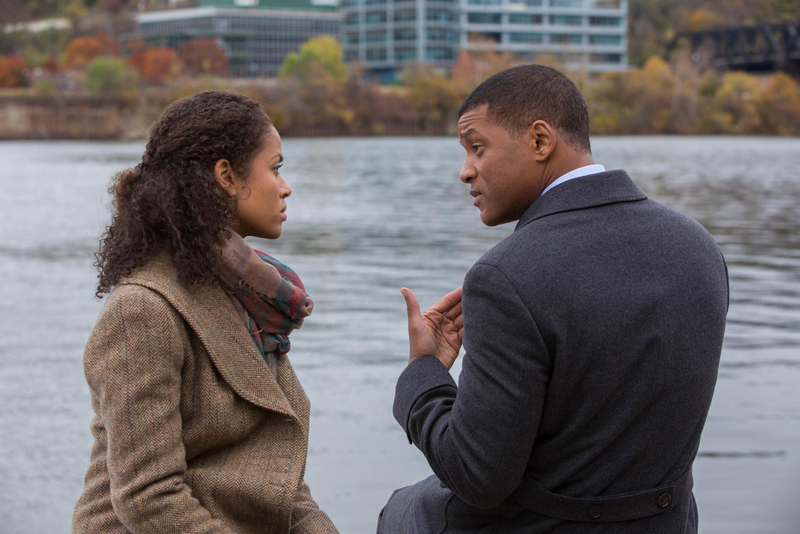 Telling a David versus Goliath type story, Concussion is a gripping, timely and riveting piece of cinema, one that works as a right-minded conversation starter on the controversial topic of whether or not a connection between progressive brain damage and the NFL truly exists. Not since the late 1990s/early 2000s — when US cigarette manufacturers acknowledged (to varying degrees) that smoking was hazardous to people’s health and a contributor in causing cancer and other such diseases — has a corporation this ‘major-league’ been challenged. A beautifully lensed, tension riddled procedural, Concussion works as ESPN’s or Fox Sports’ answer to Criminal Minds. Opening up in Allegheny County Coroner’s Office, the year 2002, we first lay eyes on examiner Dr. Omalu — a well-educated and virtuous Nigerian immigrant living in Pittsburgh, USA — at work as he autopsies frozen bodies, figuratively speaking to these corpses as if living and breathing patients, treating them with the dignity and respect they deserve. Following his startling revelation, which blames sports-related head injury (Chronic Traumatic Encephalopathy or CTE) for the deaths of multiple NFL heroes — including the legendary Mike Webster (David Morse) — this sure-footed, right-against-might narrative documents Dr. Omalu’s nerve-wracking campaign, blitzing between the man’s personal life and the battle to validate his lab-coat research. Sticking closely to a well-trodden sports-drama formula, writer-director Peter Landesman, Parkland (2013), navigates through some pretty weighty material with caution, keeping the screenplay — based on the 2009 GQ Magazine article titled ‘Brain Game’ written by Jeanne Marie Laskas — relatively soft around the edges; a creative decision possibly set in place by Sony in order to avoid antagonizing the NFL. Be that as it may, the film still uses real-life logos, names (both players and teams) and live video footage to roll out the punts. As a result of its watered-down approach Concussion often falls into the yard lines, scrambling between jarring sub-plots that throw out its confident tone — a romantic detour detracts from some the narrative’s urgency while other personal titbits from Dr. Omalu’s life feel shoehorned into the film for dramatic effect. Does Will have the Will power to take on the NFL? At the center of it all, lead Will Smith (complete with a euphonious Nigerian accent) gives a career-defining performance as the humble and honorable Dr. Bennet Omalu (chronicling the man’s inner and physical journey), a righteous practitioner who sets out on a seemingly impossible quest (ignited by his burden of ‘knowing’), taking his scientific detection, and case, all the way to the NFL, holding onto claims which more or less state that ‘man’ (through physiological makeup) was not designed to play NFL. 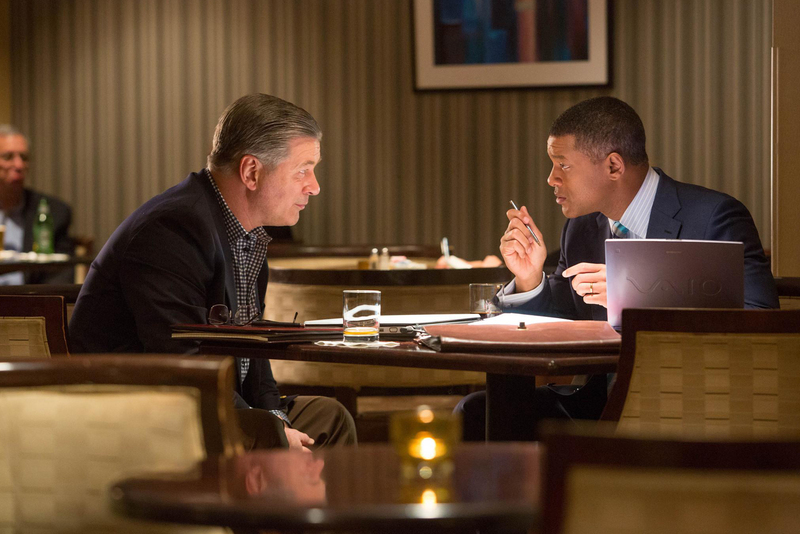 Naturally, the film’s standout moments are those that concern Smith’s protagonist clashing heads with the kingpins of the NFL, as Dr. Omalu — who, at times, comes across a little too infallible — delivers painful information that could potentially make him ‘public enemy number one’ to a group he so deeply desires to be accepted by – the American people. 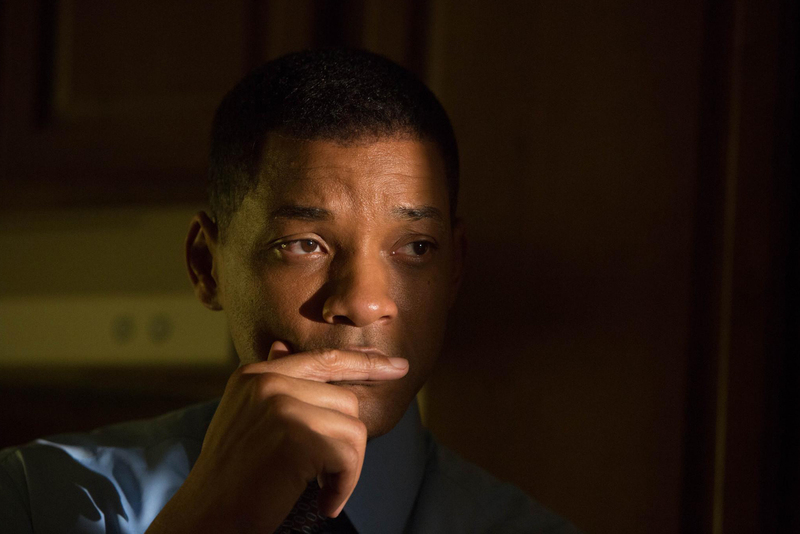 The multi-talented Smith brings a great deal of conviction to the role, humanizing a man vilified by many, the Hollywood mega-star differentiating Dr. Omalu from the slew of other characters played by the former Fresh Prince of Bel-Air — this really is Smith like you’ve never seen him before. Smith’s outstanding work on Concussion honestly deserves due recognition, leading me to believe that there may perhaps be some truth to the ‘Oscars So White ’controversy that began shrouding the Internet post January 15th, after nominations dropped. With Smith working as the film’s quarterback, he’s properly aided by competent and able support, even if these players are fairly conventional in a film of this type. First up on the peripheral pitch, Alec Baldwin, The Departed (2006), brings his A-game as former Pittsburgh Steelers’ team physician, now head neurosurgeon for the NFPA (National Football League Players Association) Dr. Julian Bailes, a profoundly conflicted guy who very quickly becomes a key ally in Dr. Omalu’s playoff; Baldwin vigilantly balancing Dr. Bailes’ torn allegiance — one that borders between his love of football and the unsettling proof evident in Dr. Omalu’s inquest. Elsewhere on the field, rising British actress Gugu Mbatha-Raw, Belle (2013), beams as Prema Mutiso, a foreigner from Nairobi, Kenya, and the newest parishioner at Dr. Omalu’s local church. Prema brings a feminine touch to Dr. Omalu’s bachelor-esque living space (and life) when she moves in with the workaholic, eventually becoming his spiritual anchor as the pair romantically entwine, bonding over the countless cultural hurdles they’ve had to endure (and basically overcome). Mbatha-Raw is a rocksteady presence, even if her overly mawkish character derails the flick’s focus from time to time. Lastly, famed comedian Albert Brooks, A Most Violent Year (2014), implants a degree of prominence to proceedings, playing Dr. Omalu’s no-nonsense boss and mentor, pathologist Dr. Cyril Wecht. Just like Dr. Bennet Omalu’s naively idealistic misplaced credence in the notion ‘the truth will set you free,’ Concussion is a brave feature as it dares to expose the harsh truths of playing NFL, laying bare the grim realities and injurious side effects caused by head-to-head collision — will this knowledge set us free? That question, folks, is best left for us to ponder. A tad on the melodramatic side, Concussion, while not a show-stopping touchdown, is still a steely punch to the gut to any football aficionado; it’s an uncompromising, fearless story (and a far cry from being cold or technical), that ultimately succeeds thanks to some superb performances and its rich, location-heavy photography, earning its merit as a testimonial in honor of a truly remarkable man — Dr. Bennet Omalu.